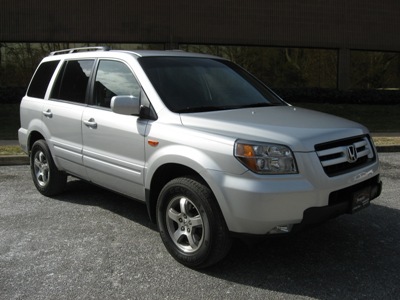 If your looking for an AFFORDABLE, SPACIOUS vehicle with a THIRD ROW, then we have a RELIABLE & ROOMY 2006 Honda Pilot EX in store for you! This pre-owned Honda SUV seats 8 passengers and has an AWD V6, 3.5 liter Automatic transmission. Honda's SUPERIOR CRAFTSMANSHIP is legendary! This Pilot has been FULLY SERVICED, PUMPKIN CERTIFIED and has a PERFECT CARFAX HISTORY report. Hand-selected by Owner Franck Freon, this Pilot is selling for $17,495! Options include an in-dash 6-Disc CD CHANGER, Power Seats, Privacy Glass Windows, Alloy Wheels, Roof Rack and more! Come in for a NO HASSLE test drive! CONTACT US at (609) 646-7676 or send us an email to [email protected]. Visit us on the web at http://www.pumpkincars.com/ for a complete list of our pre-owned vehicles or check us out on Facebook and Twitter for our daily blogs and reviews!